The dollar ran right up to the top of its descending wedge and was turned down right on it. This wedge is getting very close to completion, it is going to have to break one way or the other. It’s very interesting that we have spent this much time in the 75 area and is has not yet fallen. Bonds are rising, that is normally an indication that money is flowing from stocks and into bonds. 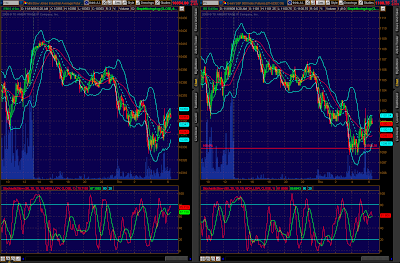 Both oil and gold are down and both have returned back inside their respective formations. Initial jobless claims didn't break through 500,000 but the report is still favorable. Initial claims were unchanged in the Nov. 14 week at 505,000 (prior week revised 3,000 higher). The four-average fell 6,500 to 514,000, down for a convincing 11th straight week. Continuing claims, down 39,000 to 5.611 million in the Nov. 7 week, extended what is an even longer run. The expiration of benefits, however, cloud the significance of this reading. Benefits were extended to more than 17,000 to 540,000, with 3.6 million receiving emergency compensation, up 100,000 (both Oct. 31 week). The unemployment rate for insured employees is unchanged at 4.3 percent. This rate has been coming down, in contrast to the overall unemployment which of course is now in double digits at 10.2 percent. Commodities and stocks moved higher in reaction to the report, one which will boost confidence that the layoff cycle, that is payroll contraction, is in fact winding down. Uh, huh, “The expiration of benefits, however, cloud the significance…” Cloud is a great word, because that’s the one appropriate word to use for government statistics. Want a piece of what’s really happening? Here you go, despite a 14 week extension of unemployment benefits, if Congress does not act to extend them again before Christmas break, instantly 1 million people will have their benefits cut off. That’s 1 million! That’s a pretty sizable chunk of Americans and stopping that money would not be a good thing for the economy, and especially for those who cannot find jobs. About one million laid-off workers will see their unemployment benefits end in January unless Congress acts quickly to renew existing federally paid extensions, according to a new survey and legislators and state officials. The record extension of emergency benefits that was signed into law on Nov. 6 was widely praised as a lifeline for hundreds of thousands of Americans who had spent a year or more in fruitless searches for jobs. The new law provided up to 14 weeks of federally paid aid to unemployed people who had exhausted existing state and federal limits, benefits that already lasted up to 79 weeks in many states. And for the majority of states with particularly high unemployment, it added six more weeks of payments, bringing the potential total to 99 weeks. But many legislators, state aid officials and struggling workers apparently failed to read the fine print. The added federal benefits were built on a series of previous extensions that are slated to end on Dec. 31, unless Congress renews these programs. People who lost their jobs after July 1 of this year, for example, would receive no federal extensions once their customary six months of state aid ran out. While discussions have started, Congress is not yet considering a specific proposal. And unless it acts before the Christmas break, officials warn, the extensions will end. If Congress, now caught up in the health care overhaul, delays action until next year, millions would face gaps in aid that many thought would be automatic. “There are six people looking for every available job, and these payments are enabling people to pay their mortgages and put food on the table,” said Representative Jim McDermott, Democrat of Washington, who championed the Nov. 6 law and hopes to light a new fire under Congress. “It’s a horribly complicated system, and most people didn’t pay attention,” Mr. McDermott said. He and Congressional staff members said that while they believed an extension would eventually pass with broad support, action in the next few weeks is by no means certain. Renewing all federally paid extended benefits for 2010 would cost about $80 billion, Mr. McDermott said. But her extensions ran out early last month and in subsequent weeks, as Congress deliberated, her life fell apart. She has just started receiving what will be 14 extra weeks of aid under the new law, but faces eviction from her apartment in Brentwood, Tenn. “There’s no way I can recover now, I’m too far behind,” she said. In ordinary times, unemployed workers in most states receive 26 weeks of benefits, averaging just over $300 a week, paid from state insurance funds. Many find jobs before exhausting the aid, but unemployment has been particularly tenacious in the current recession and recovery. Under temporary measures, workers are currently eligible for a series of federally paid extensions, awarded in stages often lasting 13 or 14 weeks at a time. Some nine million people now receive unemployment benefits, five million on the initial state programs and four million through federal extensions. 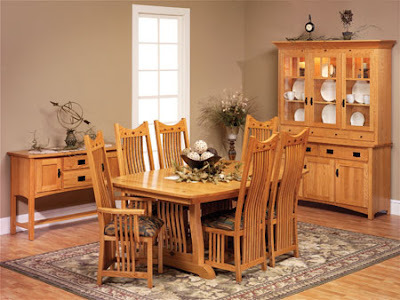 Without renewal of the programs for 2010, at the turn of the year recipients will continue receiving benefits to the end of their current stage but will no longer jump to the next stage. Thus Ms. Jarrin, if she fails to find work, will finish out the new 14-week period but will not receive the additional six weeks that Congress promised. She said she had sent out 2,000 résumés and had only a handful of interviews, without success. According to projections released Wednesday by the National Employment Law Project, an advocacy group that worked with state officials to develop the numbers, 474,111 unemployed workers will exhaust their state benefits in January and, in the absence of Congressional action, not receive any extensions. An additional 581,000 workers will see their federal benefits end in January, the study said. Ms. Dunphy of New York said that without a federal renewal, 685,000 New Yorkers would not receive expected benefits in 2010. While economic growth has resumed, economists say that job growth will be sluggish, with high unemployment, now at 10.2 percent, persisting through most of the coming year. In addition to renewing the benefit extension, Congress must decide whether to extend aid for Cobra health insurance payments for the unemployed, a tax break on unemployment payments and a $25 a week increase in benefits, all adopted in the stimulus act in early 2009. Did you catch that? Nine million are now receiving unemployment, no wonder the trust funds is absolutely broke. Of course I believe that the oligarchs WILL get an extension passed. Why? Because they can just print the money with no effort on their part and it will placate the people with corn syrup a little bit longer, thus delaying their day of reckoning. If you think I’m joking about that, you would be wrong. The “leading” indicators and the Philly Fed Survey come out at 10 Eastern. The leading indicator is a JOKE, but is highly respected by knuckleheads everywhere. If you can believe this, the stock market is a large component of the index, thus when the market does a bear market bounce, this indicator goes up, the knuckleheads think P/E’s above 130 are good and convince themselves that it’s not really that high, and look at those leading indicators, and the circle inside of Wonderland continues. I have no idea how the rest of it is going to turn out, so be ready for anything when it does. Personally, I would love to see a dramatic rise here into options expiration tomorrow, but I’m pretty sure that’s not going to happen, but it could, a lot of people are looking for at least 1,120 here. 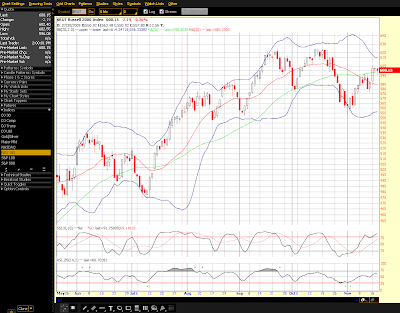 On the other hand, if this indicator disappoints, look out below. But the false bull market is running out of steam and out of time. 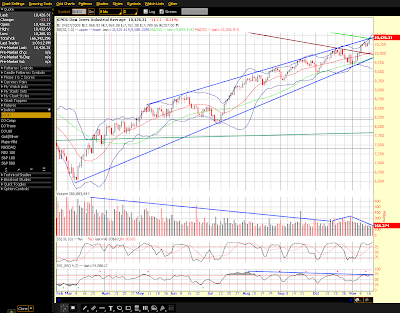 The market has been playing that rising wedge and it is getting very near completion. 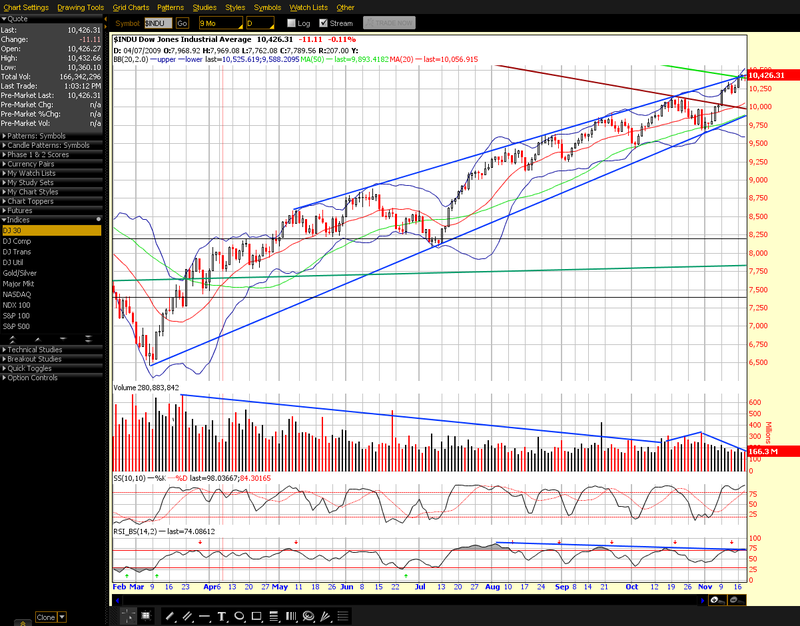 Below is a 9 month chart of the DOW showing the wedge clearly and how near we are to being out of time. The dollar has the opposite wedge, it too, is running out of time. Note the historic divergence in volume – historic. 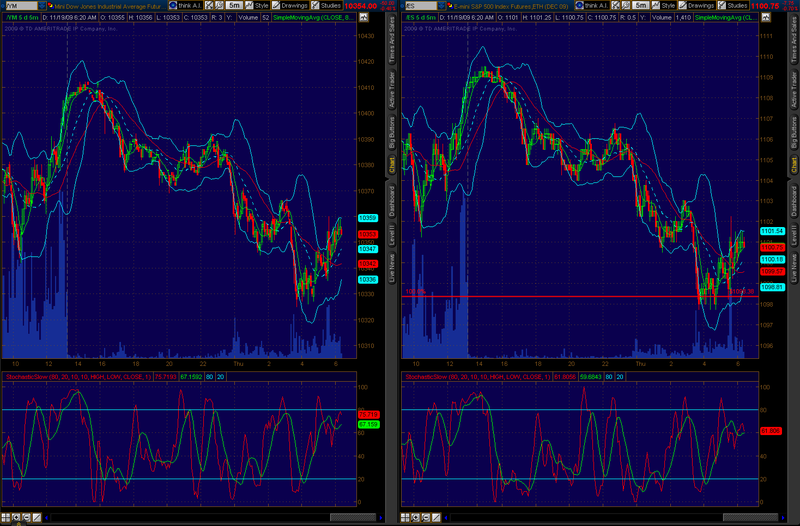 Note the obvious and huge divergence in RSI. Are the “playas” using this TA against us? Well, this pattern is very obvious, EVERYONE knows its there and that does make for an interesting situation, but if it were going to behave differently, why hasn’t it morphed into some other pattern and why is it sticking to rising wedge script so well? It IS going to break, an overthrow of the top is also typical, so don’t get excited if we run higher. 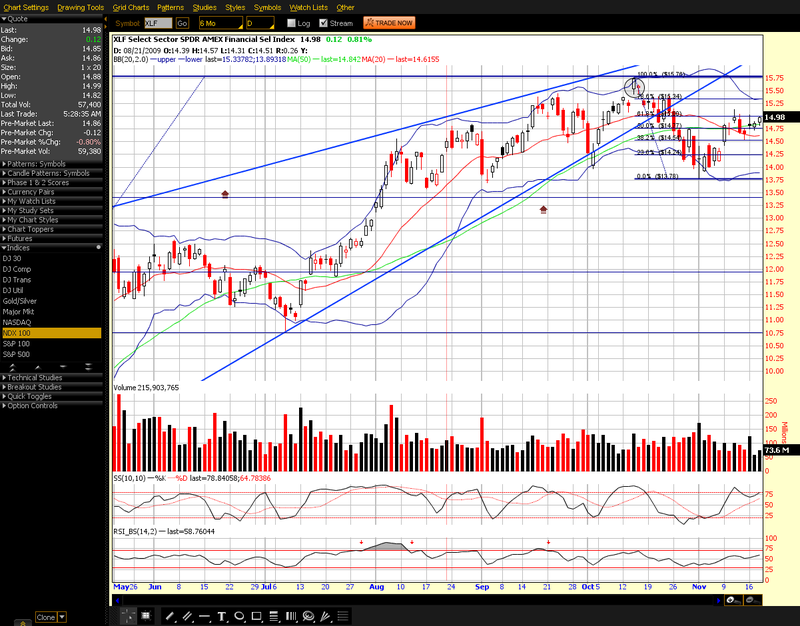 Note the highlighted candle on the XLF mid-October. 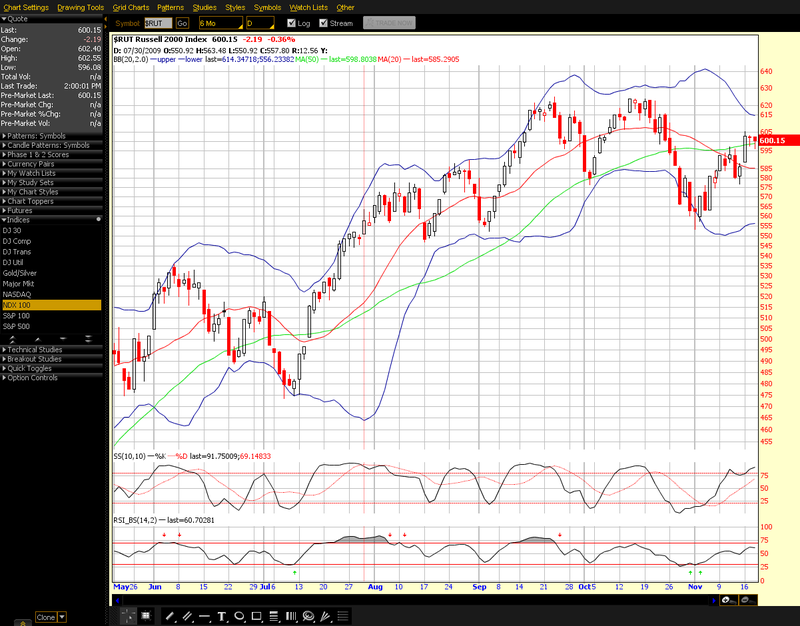 In fact, that timeframe is pretty close to what I see as an “internal” high. The only real market progress is due to the devaluing of the dollar and market internals are diverging from price. By the way, when priced in gold, this B wave rally actually has not happened at all! That’s right, stocks have continued straight on down when priced in gold. Interesting. Where are we in the Elliott Wave count? The primary count has us in the final wave c up. This wave can extend or truncate. It should have 5 subwaves and if McHugh is correct, the sideways action of the past couple days should be wave ii or wave 2 of the final 5. Again, not all 5 waves have to happen, this could have already topped, or it may run higher. Yesterday the VIX diverged against prices by falling nearly 3%. This is nothing but extreme complacency in my opinion. Normally you would look at that as a bullish short term divergence, but when we reach extremes, it can also be a sign that a turn is at hand due to the psychology of everyone believing the market is heading higher. Of course the VIX is not as powerful a tool as it once was. That’s because the options it measures are no longer the only way to play against the market. A ton of money now plays in the ETF space and in futures, and the VIX does not measure their impact. In fact, the entire market really doesn’t do what it was intended to do (provide a market for capital to be fairly priced and distributed to private companies), instead it has literally been turned into the banker’s casino. This casino is what almost everyone has been forced to base their retirements on. Not the productive efforts of the nation, no, now our futures are all based on the ability of the casino to create never ending growth for the oligarchs. How’s your 401K looking? Rally helping it out? Who do you think is being helped more? The dollar has turned down one more time from the upper boundary of its descending wedge, the game continues for now.